According to the FTC (Federal Trade Commission), Florida is the state with the highest per capita rate of reported fraud in the country. If you are 65 or older, or have parents who are, here are 5 steps you can take to protect your money. It’s no secret seniors have always been the target of hucksters and scoundrels, perhaps because seniors tend to have their money mostly in cash and easily accessible… But what may come as a surprise is that according to the The National Council on Aging (NCOA) it’s not always strangers who carry out these crimes, unfortunately OVER 90 PERCENT of all reported elder abuse and fraud is committed by an older person’s own family members, most often their adult children, followed by grandchildren, nieces and nephews, and other people in close social proximity. When getting a call from a stranger regarding a new service or business opportunity …one of the first things they are going to want to get from you right away is your core personal info, in other words, personal info they don’t yet have. DO NOT provide your social, bank account numbers, secondary addresses, full name, and DOB, even though these last two are increasingly easy to get these days. Instead, take control of the conversation and start asking questions to validate their source and identity as much as possible. Ask for the name of the person calling you, company, phone number, website, and supervisor. 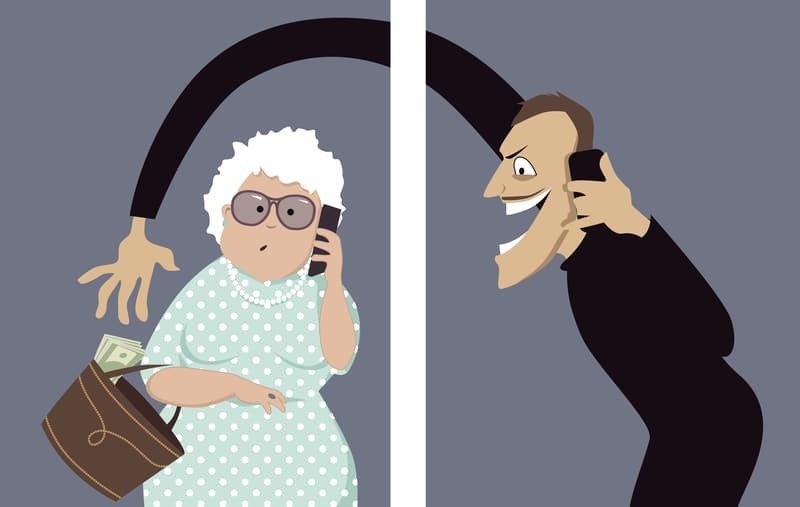 Remember… DO NOT provide any information over the phone EVEN IF you validate their source and identity!!! Protect your computer… Hire an IT professional to help you install both antivirus and anti-spyware software. Pretty much all antivirus will have anti-spyware included so don’t get confused over the terminology. This will keep potential hackers and intruders off your accounts. Do not open email from people or places you don’t recognize… When you inadvertently or just out of curiosity click on a link or download a file sent to you by a stranger, you are opening the door for someone to come in that way. Also, if you are being requested to reset your password on a current account, but you didn’t make this request, or they are saying is for security reasons, DON’T DO IT … Call the company’s customer service department and confirm that indeed an email was sent for you to reset your password. Monitor your accounts closely… make sure you activate automatic texts and emails from your banks and credit cards every time a purchase or a deposit is made in your account. Most banks and credit unions have these kinds of services. Slow the process down and don’t be embarrassed… When telemarketers and sales people call you they usually tend to talk fast and get you to take action on the spot, that’s just the way they’ve been trained. Slow things down, ask them basic questions regarding their services, especially if it entails transferring money to a new account or claiming a prize that requires opening an account first. Don’t be embarrassed about not being familiar with what they are talking about or asking stupid questions… believe me, there are no STUPID questions when it comes to protecting your money and identity. If it sounds interesting, take their information, hang up the phone, and start doing research on your own. Call your trusted advisors and have them look into it. Remember, you’re in no rush! If it’s a good opportunity it’ll still be there when you are done with your due diligence! Federal Trade Commission, 1-877-382-4357. Agency for reporting identity theft and abusive debt collectors. National Do Not Call Registry, 1-888-382-1222. For reporting unsolicited sales calls. Consumer Financial Protection Bureau, 1-855-411-2372. For complaints about shady business practices, loans, banks services and credit reporting. Internet Crime Complaint Center. For reporting internet-based scams. Postal Inspection Services, 1.877-876-2455. For reporting scams distributed by U.S mail. Agency For Healthcare Administration, Florida 1-888-419-3456. For complaints about the quality of care provided in Florida’s health care facilities. There you have it, 5 easy steps to protect yourself from financial scams and rackets, and make sure no one takes you for a ride and bamboozle you out of your hard-earned money!